Jennie-O as some great recipes for Cinco de Mayo! I am especially pleased with these Miami Steet-Style Turkey Tacos . I was pleasantly surpised to find out that there are made with Lean Taco Seasoned Ground Turkey from Jennie-O and topped with a mango citrus slaw. Each taco contains only 180 calories. 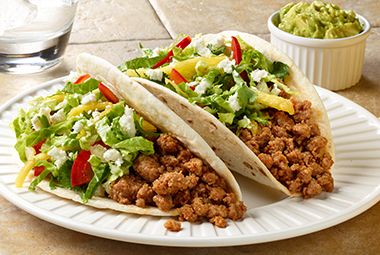 You can eat guilt free for Cinco de Mayo with this great recipe from Jennie-O. This is easy to make in under 30 minutes(HELLO!) and is a low calorie meal! What are some of your favorite meals to make with Jennie-O products? Jennie-O provided me with coupons in exchange for this post.